The player uses a joystick and a single button as controls. 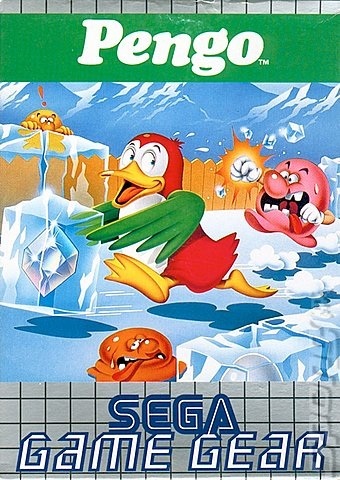 Pressing the button while pushing the joystick will cause Pengo to push forward the ice block he is facing, which will slide until it hits a wall or another ice block, crushing any intervening Sno-Bees. Crushing more than one Sno-Bee at once will increase the number of points awarded. There are a total of sixteen levels, which repeat in order starting on the seventeenth round. As the player crushes those on patrol, new Sno-Bees hatch from eggs located within ice blocks. At the start of each level, blocks that contain these eggs are briefly identified by flashing the color of that level's Sno-Bees. Eggs can be eliminated by crushing the ice blocks that contain them. If Pengo pushes a side wall the water "vibrates", any adjacent Sno-Bees will be briefly stunned, and are eliminated (for 100 points) if Pengo walks over them in this state. Eliminating all Sno-Bees in a round will progress the player to the next. Diamond blocks are unbreakable; when connected in a horizontal or vertical line the player earns bonus points: 10,000 points if aligned without being against a wall or if only one diamond block is touching a wall, 5,000 points if all three are against the wall. Alignment will also temporarily stun all Sno-Bees. After 60 seconds elapse in a round without a death, the game enters into sudden death mode; the music tempo and movement of the Sno-Bees accelerates. If a single Sno-Bee remains in the round, a jingle plays and the Sno-Bee accelerates in an attempt to reach a corner where it safely fades away. The game will always start with the same maze on power up. Once the game has gone through the attract mode, the maze will change. There were two versions of the arcade game. The first used "Popcorn" as theme music and took a few moments to draw the maze at the beginning of each level. The second had original music and faster maze drawing. There were difficulty differences as well, with the second version being harder.